An international team of astronomers has found a system of seven potentially habitable planets orbiting a star 39 light years away, three of which could have water on their surfaces increasing the possibility they could host life. Using ground and space instruments and telescopes, including the ACAM imager on the William Herschel Telescope, the team identified the planets as they passed in front of the ultracool dwarf star known as TRAPPIST-1. The star has around eight per cent of the mass of the Sun and is no bigger than Jupiter. 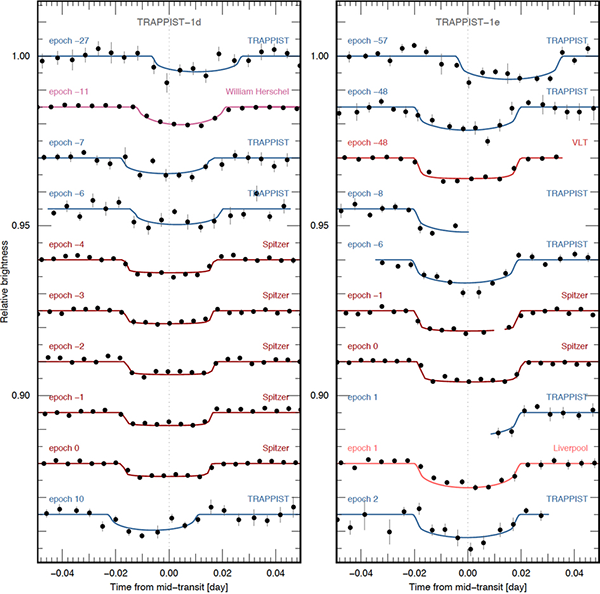 The astronomers identified the planets thanks to periodic drops in the brightness of the central star. As the planets passed in front of the star they cast a shadow, events known as transits, from which the team could measure the planets' orbital periods and calculate their sizes and masses. They found that the inner six planets are comparable in size, mass and temperature to the Earth, raising the possibility that they host liquid water on their surfaces. The density measurements suggest that they are probably rocky in composition. Transit light curve for planets d and e. The black points show the photometric measurements, binned per 0.005 days (7.2 min). The error for each bin (shown as a vertical line) was computed as the 1-sigma error on the average. 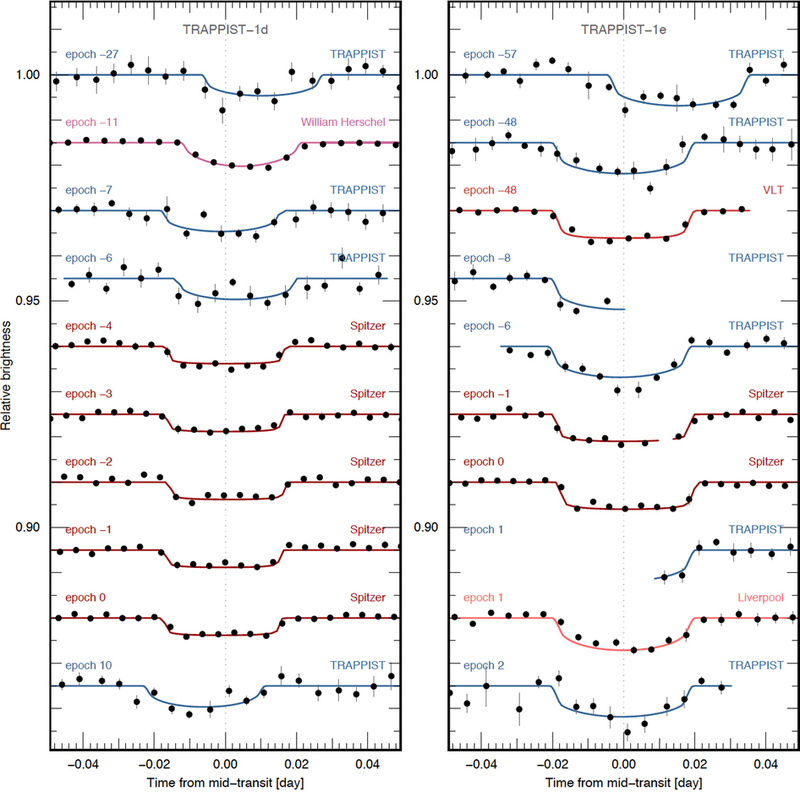 These light curves are divided by their best-fit instrumental models and by the best-fit transit models of other planets (for multiple transits). The best-fit transit models are shown as solid lines. The epoch of the transit and the facility used to observe it are indicated above each light curve, including WHT/ACAM's light curve transit of TRAPPIST-1d on epoch 11. Extracted from Guillon et al., 2017, Nature, 542, 456. Large format: PNG. Co-author Amaury Triaud, of the University of Cambridge's Institute of Astronomy, explains: "Stars like TRAPPIST-1 belong to the most common type of stars that exist within our Galaxy. The planets that we found are likely representative of the most common sort of planets in the Universe. And that the planets are so similar to Earth bodes well for the search for life elsewhere. Planets orbiting ultra-cool dwarfs, like TRAPPIST-1, likely represent the largest habitable real estate in the Milky Way!" The planetary orbits are not much larger than that of Jupiter's Galilean moon system, and much smaller than the orbit of Mercury in the Solar System. However, TRAPPIST-1's small size and low temperature means that the energy input to its planets is similar to that received by the inner planets in our Solar System; TRAPPIST-1c, d and f receive similar energy inputs to Venus, Earth and Mars, respectively. All seven planets discovered in the system could potentially have liquid water on their surfaces, though their orbital distances make some of them more likely candidates than others. Climate models suggest the innermost planets, TRAPPIST-1b, c and d, are probably too hot to support liquid water, except maybe on a small fraction of their surfaces. The orbital distance of the system's outermost planet, TRAPPIST-1h, is unconfirmed, though it is likely to be too distant and cold to harbour liquid water — assuming no alternative heating processes are occurring. TRAPPIST-1e, f, and g, however, are of more interest to planet-hunting astronomers, as they orbit in the star's habitable zone and could host oceans of surface water. These new discoveries make the TRAPPIST-1 system an even more important target in the search for extra-terrestrial life. Team member Didier Queloz, from the University of Cambridge's Cavendish Laboratory, is excited about the future possibilities: "Thanks to future facilities like ESO's Extremely Large Telescope, or NASA/ESA's soon-to-be-launched James Webb Space telescope, we will be able to measure the structure of the planets' atmospheres, as well as their chemical composition. We are about to start the remote exploration of terrestrial climates beyond our Solar system." Michaël Gillon,	Amaury H. M. J. Triaud,	Brice-Olivier Demory,	Emmanuël Jehin,	Eric Agol,	Katherine M. Deck,	Susan M. Lederer,	Julien de Wit,	Artem Burdanov,	James G. Ingalls,	Emeline Bolmont,	Jeremy Leconte,	Sean N. Raymond,	Franck Selsis,	Martin Turbet,	Khalid Barkaoui,	Adam Burgasser,	Matthew R. Burleigh,	Sean J. Carey,	Aleksander Chaushev,	Chris M. Copperwheat,	Laetitia Delrez,	Catarina S. Fernandes,	Daniel L. Holdsworth,	Enrico J. Kotze,	Valérie Van Grootel,	Yaseen Almleaky,	Zouhair Benkhaldoun,	Pierre Magain	& Didier Queloz, 2017, "Seven temperate terrestrial planets around the nearby ultracool dwarf star TRAPPIST-1", Nature, 542, 456. Paper: Nature | ESO. "Ultracool Dwarf and the Seven Planets", ESO press release, 23 Feb 2017. NASA Telescope Reveals Largest Batch of Earth-Size, Habitable-Zone Planets Around Single Star, NASA press release, 22 February 2017.